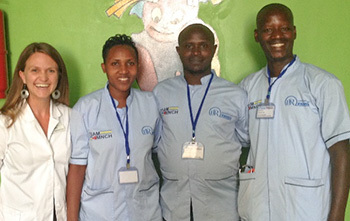 When Amy Olson and her family moved to Kigali, the capital of Rwanda, two years ago, there were only three pediatric specialty nurses in a country of 12 million people. Having a background in pediatric nursing since 2004, Amy’s desire was to train pediatric nurses in the country. She became involved with a project called Training, Support, and Access Model for Maternal, Newborn, and Child Health in Rwanda (TSAM-MNCH). From a small start with 15 nurses, the new nursing curriculum can affect children’s health for the whole nation while reinforcing the biblical values of honesty and integrity. From 2016-2017, Amy worked with six Rwandan nurses to contextualize a pediatric nursing curriculum. This past January, 15 nurses enrolled in the first pediatric nursing course. The nurses will soon complete the course and return to their hospitals or nursing schools to apply their new knowledge and pass it along to other nurses. A second group will begin the course in December or January. 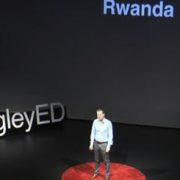 One of the challenges the Rwandan nurses face is getting pediatric medications and equipment. They lack pediatric blood pressure cuffs and scales in many hospitals, which are basic equipment to properly treat sick children. The equipment and medication is available in the country. They need to work on distributing it to where it is needed. The TSAM-MNCH project is a capacity building partnership project based out of Western University in Ontario, Canada, partnering with the University of Rwanda School of Nursing and Midwifery (UR-SONM) and nursing schools around Rwanda to train pediatric nurses. Amy and her husband Joel, together with their three children, plan to be in Rwanda until July 2019. Joel serves as an education advisor to Wellspring Foundation for Education and technical consultant to Wellspring Academy. The TSAM-MNCH project will continue until 2020 and has a partnership with the Western University in Ontario, Canada. The University of Rwanda will take over the Pediatric Nursing CPD Course when the project is finished. Amy will spend the next two years researching the impact of the Pediatric Nurisng CPD Course on nursing practice in Rwanda while completing her Master of Science in Nursing degree at Western University.